A MOO Marketing Agency Branding, Marketing and Graphic Design Project. Greythorn Central is a vibrant shopping strip in the eastern suburbs of Melbourne. A key component of their marketing is the production of a regular magazine. MOO Marketing were commissioned to redesign the magazine to be more contemporary and up market. 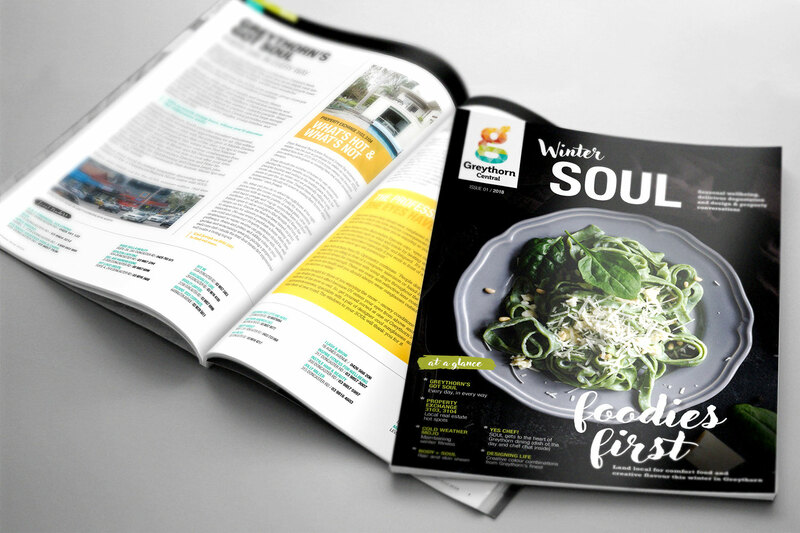 The goal was to highlight the abundance of local traders whilst at the same time providing informative articles on latest trends in fashion, food and other products. The project commenced with MOO’s marketing professionals consulting with the client which was followed by our graphic design team developing concept designs. As a full service marketing agency, we have the dedicated professionals and expertise on staff to take this project from concept to reality. The redesigned magazine has been extremely well received by both the traders and the local community. MOO managed the print production as well to ensure a high quality finish within the print budget. If your looking for a marketing agency, graphic design agency, brand and creative agency, copywriters, content marketing or digital marketing contact us. Whilst we’re Melbourne based, we do marketing services and graphic design services throughout Australia. Large or small, we’d love to hear from you.